For more than 100 years, Millersville University Athletics has been a source of pride for the campus and entertainment for the community. 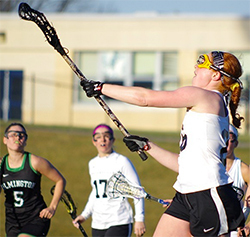 Millersville’s 19 teams and more than 450 student-athletes, competing at the NCAA Division II level, host more than 100 intercollegiate events on campus each year with tens of thousands of students, community members and university staff filling the stands. 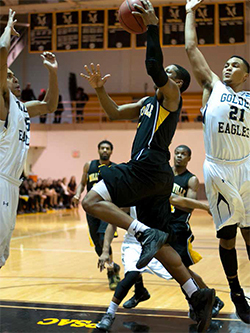 Millersville University’s Corporate Athletic Support provides your business with a variety of marketing activities to reach the ‘Ville market and its community fan base. Partnering with the Marauders is a powerful a cost-effective way to reach your target audiences. Attending Millersville University are 9,000 students with 65,000 alumni, including 16,000 living in Lancaster County. The athletics website, Millersvilleathletics.com receives nearly 600,000 visits annually. In addition to athletic events, our facilities are utilized for dozens of camps and clinics attended by local children and their parents. Marauder student-athletes and coaches are highly visible in the community, performing thousands of hours of community service each year, donating time to schools, parks, community centers and businesses. More than 100 of our student-athletes produce a GPA over 3.25. Our student-athletes continue to graduate and have higher GPAs than the undergraduate student body. In recent years, Marauder student-athletes continue to compete at the highest levels, winning numerous conference and regional championships and competing at the national level. Official sponsor of Millersville Athletics, Hall of Fame Dinner recognition, signage at three facilities of your choice, Pucillo scoreboard sign, MSBN presenting sponsor and commercial, major web page ad, game day sponsor and public address announcements. Signage at two facilities of your choice, website ad, MSBN commercial and main web page ad. Signage at facility of your choice and Marauder Spots website ad. * Sport specific naming opportunities available.